The story of letterpress printing in Lancaster County, PA, is a powerful and mysterious history. 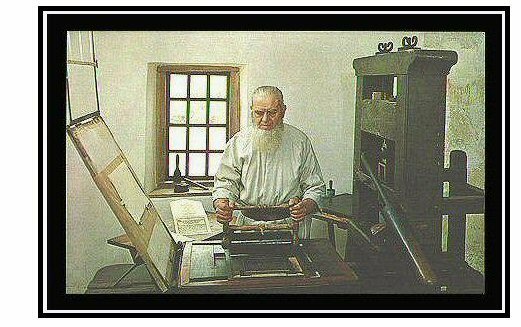 It is the story of hometown printers who harnessed the magick of Gutenberg's Black Art to create a revolutionary Free Press. It is the story of religious mystics who printed landmarks of American book arts. It is the story of small-town printers who mastered the power of the printed word to help create a nation. Peter Miller and the Ephrata Cloister - Sleep-deprived monks create icons of colonial American bibliography. Heinrich Miller - In partnership with Ben Franklin, Henry prints the first book and the first significant newspaper in Lancaster City. Later in Philly, Heinrich prints the first newspaper announcement of the Declaration of Independence. Francis Bailey - An obscure (but radical) country printer helps win the American Revolutionary War. Lydia Bailey - A printer from Lancaster County shatters glass ceilings to become America's most successful woman printer of the 1800s. The Bauman Family - Joseph, John, and Samuel continue the craft. Christian Hütter - Another Moravian printer. (Do I detect a theme here?) Christian also owns a bookstore selling "8,000 of the latest and best German books." William Hamilton and Henry Willcocks - 1790s: William and Henry print newspapers that evolve into today's Lancaster Newspapers. William, Mary, and Robert Dickson - 1790s: The Dickson Family creates a newspaper that evolves into today's Lancaster Newpapers. Henrich and Benjamin Grimler - 1804: Two Lutheran brothers publish Der Wahre Amerikaner newspaper ("The True American" newspaper) ...and they publish true American books. Peter and Timothy Montelius - Father-and-son printers create American folk art in Reamstown. Joseph Ehrenfried - A Swedenborgian printer prints important books for the Mennonites. J. M. Willis Geist - He didn't like being a schoolteacher, so he becomes one of Lancaster's most influential printer / publishers. John Pearsol - A Lancaster Gazette errand boy becomes a master printer and publishes an influential Lancaster newspaper. Stuart Wylie - 1860s - Stuart creates Pennsylvania's "most extensive" print shop. But he works hard and dies young, at age 32. John Forney - An intimate friend of President Buchanan and President Lincoln becomes one of the most powerful publishers of his era. Jacob Stauffer - Manheim's Renaissance Man publishes Manheim's first newspaper. (And he begets David McNeeley Stauffer). David Bachman Landis - 1880s: David invents Lancaster's best (and worst) name for a print shop: "Pluck Art Printery." Isaac Palm - A crippled Mennonite teenager prints house blessings for his neighbors. John Fass - 1950s: A Lititz typographer prints expensive books about Lancaster County in his tiny room in the Bronx YMCA. The .918 Club - 21st Century: Heritage Center volunteers continue the art of handset printing.